Website design and development for top downtown Austin Indian restaurant. G’Raj Mahal started their business by serving up authentic Western Indian comfort food to Austin locals out of a modest food trailer just off of Rainey Street. After word got out about this hidden downtown gem, they quickly outgrew their trailer and opened up the G’Raj Mahal Café and Lounge brick and mortar space to accommodate the large devoted following they had attracted. To go with this growth, it became increasingly clear that the restaurant needed a fully responsive website that complemented the vibe of their brand new location. To successfully capture G’Raj Mahal's fusion of traditional with contemporary, we designed a website that is fully responsive on both web and mobile that incorporates elements of Western Indian culture with bold, modern graphics. Since the restaurant prides itself on its constantly changing menu to keep the food they serve exciting and relevant to their loyal customers, we developed each custom subpage in a way that allows them the ability to easily change content as their menu and specials change. Another custom-developed page also allows customers to view available time slots for any day and make reservations online, streamlining the overall user experience. 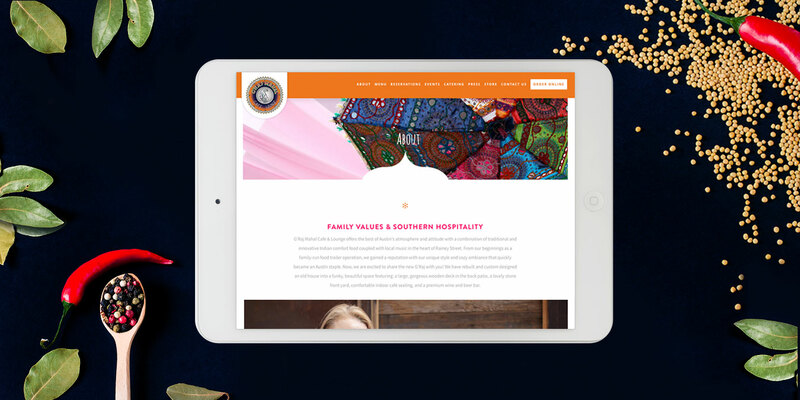 "Not only did the MODintelechy team deliver a website that aesthetically matched the signature G’Raj Mahal brand and attitude, but they also ensured it was user-friendly and responsive across all platforms. Nailed it!" The response to G’Raj Mahal’s website overhaul (also a Graphic Design USA Award winner) was overwhelmingly positive from their loyal clientele, which continues to grow at a rapid rate thanks to their delicious Indian cuisine and southern hospitality.